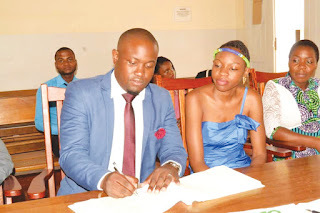 Lorraine Sibanda sign their marriage certificate. SHURUGWI- Tongogara Rural District Council chairman Tamiswa Njovhana tied the knot on January 11, 2018 with Nomagugu Lorraine Sibanda at a private ceremony at Gweru Magistrate’s Court. Njovhana (31) who is a pilot and Sibanda (28) who is an airhostess working in South Africa met through a mutual friend in December of 2017. Njovhana is the last born of Samuel and Eunice Njovhana from Tongogara Shurugwi and Sibanda is the first daughter of Newman and Shirley Sibanda from Lundi Park Gweru. Njovhana said that the stability that comes with marriage will make him a better leader for the community. “I am happy to begin this journey at a time that I have responsibilities to my community, the stability will be an asset to me,” said Njovhana.